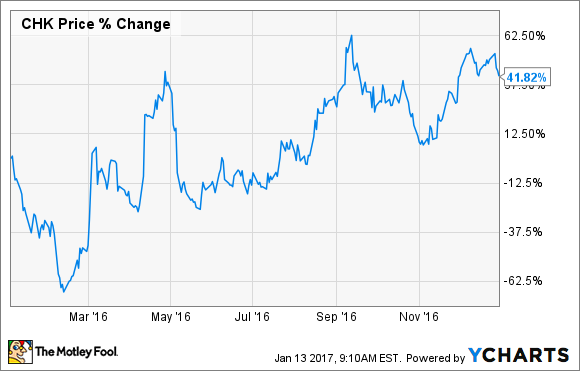 Is Chesapeake Energy Corporation's Stock Flying Too Close to the Sun After a Great 2016? After tumbling into the year, the natural gas giant found its footing and rebounded sharply despite the fact that it still has billions of dollars in debt. However, where Chesapeake Energy's stock goes next is anyone's guess. While the company made significant progress last year putting it on the pathway toward sustainability, it's not quite there yet. It needs to make even more progress before it's firmly on solid ground. Failure to do so could burn investors this year, while continued success could keep the stock flying high. Chesapeake Energy used three tactics last year to start climbing out of the hole it dug itself: selling assets, reducing costs, and working with creditors on solutions to reduce debt and extend maturities. On the asset sale side, the company started the year off securing $700 million of divestitures by the end of February and planned to target an additional $500 million to $1 billion by year end. It increased that guidance a few months later after signing more sales agreements, and by the end of the year, it announced a total of $2.5 billion of asset sales, which exceeded its revised goal by $500 million. Meanwhile, Chesapeake Energy relentlessly drove costs out of its operations. On the capital side, the company started the year with a capex budget range of $1.3 billion to $1.8 billion, which, at the midpoint, was 57% below 2015's spending level and was just enough capital to keep asset sale adjusted production roughly flat to down 5%. Driving that capital efficiency was the company's ability to innovate, enabling it to produce more for less money. The company continued to become more efficient as the year wore on, and by the third quarter, it had increased the production forecast to 0%-3% growth while capping spending at the top end of its range. Another contributing factor to improving its cost structure was a string of midstream contract renegotiations with Williams Companies (NYSE:WMB). For example, Williams Companies and its MLP agreed to terminate an existing gas gathering contract in the Barnet Shale, enabling Chesapeake to unload that asset. Meanwhile, another agreement with Williams will improve Chesapeake's economics in the Powder River Basin and support increased development in the region. Overall, moves like these helped Chesapeake Energy reduce cash operating costs per barrel of oil equivalent by 50% from the peak in 2012. Finally, Chesapeake Energy worked tirelessly with creditors to chip away at debt and push out near-term maturities. By the end of the third quarter, debt was down $1 billion from year end to $8.7 billion. Further, the company reduced the burden of debt maturing through 2018 from $3.7 billion as of the end of 2015's third quarter to $1.2 billion as of last November. These moves have lifted a significant weight that had been holding the stock down. While Chesapeake Energy made tremendous progress last year, it still has several issues left to address. Topping that list is further improvements to its balance sheet. As of last November, Chesapeake Energy had $9.6 billion of debt, including $1.7 billion maturing through 2019. The company has already started working on chipping away at this debt by launching more tender offers to repurchase these notes. However, the company will need to continue selling assets and get debt down to a more manageable level. The company also needs to keep driving out costs so it can run sustainably at lower commodity prices. As things currently stand, Chesapeake Energy plans to deliver 5% to 15% annual production growth through 2020. However, it will not reach cash flow neutrality until 2018 (and that's assuming $60 crude and $3 natural gas), meaning it purposefully plans to spend more than it will bring in this year to grow production, which is a strategy that nearly destroyed it in prior years. That said, Chesapeake Energy is not the only shale driller that sees 2017 as a bridge year to cash flow neutrality. Pioneer Natural Resources (NYSE:PXD) has a similar strategy to deliver 15% annual production growth through 2020 while planning to live within cash flow starting next year. However, Pioneer Natural Resources has two distinct advantages over Chesapeake. First, it can achieve cash flow neutrality at a much lower oil price of just $55 per barrel, and it has a mere $300 million of net debt. Further, Pioneer Natural Resources sees its net debt-to-EBITDA ratio remaining below 1.0 times through 2020, while Chesapeake's plan is to get its ratio down to 2.0 times in the future. The concern here is that Chesapeake Energy's decision to outspend cash flow in 2017 could burn investors if commodity prices take another deep dive. Chesapeake Energy entered 2016 teetering on the brink of bankruptcy. However, it was able to push away from the precipice thanks to several efforts aimed at cutting debt and costs, which lifted a significant weight holding down its stock price. That said, the company is not yet back on solid ground because it still has too much debt and isn't living within cash flow. Those issues could burn investors this year if commodity price tumble. To avoid that fate, the company needs to exceed expectations and get back on a sustainable path much quicker. If it can do so, this stock could continue flying high in 2017.